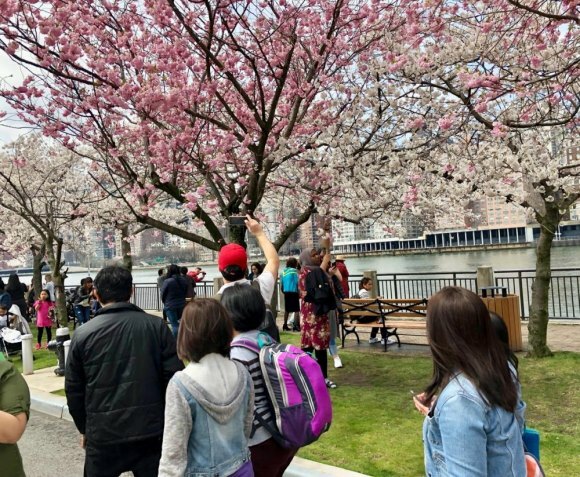 Two things are clear about Saturday's Roosevelt Island Cherry Blossom Festival. First, performances and everything else taking place inside FDR Four Freedoms Park was beautifully executed, virtually flawless and thrilling at the same time. But screwups festering outside, some for weeks in advance, recklessly endangered safety and tarnished our community's image. You could see it coming, and many did but were ignored and, worse, demonized. To stage hours of music and dance before a packed house on a blissfully mild spring afternoon, Four Freedoms Park executives Howard Axel and Madeline Grimes worked seamlessly with Common Council Leaders Lynne Strong-Shinozaki and Lydia Tang, Jim Luce and his generous foundation as well as Main Street Theatre & Dance Alliance. The event matched all expectations. That should be the end of the story. But it isn't, for several reasons, the worst of which is that bumbling PR and poor external planning opened the door to allow Twitter crybabies, abetted by the likes of the routinely offensive New York Post, to dominate the narrative. The only individuals connected with staging the festival who stood up in the aftermath were MST&DA's Executive Director Kristi Towey, who proudly posted videos on Saturday, and Luce who released a frustrated statement on Sunday night over Facebook. RIOC, as usual, was off for the weekend, leaving everyone else to contend with the fallout. And that included Strong-Shinozaki and Tang who, after mangling relationships within the Common Council, were left to take on more than was realistically possible by themselves. A videographer recorded everything happening on the stage, and Strong-Shinozaki promised to share it with "all the media." That would've made for an effective counterbalance against the internet whining, but it never happened. We still don't have the video. Common Council leadership must also take responsibility for the paucity of food and beverage vendors. It's not as if it hadn't happened before, but lessons went unlearned, the shortage exacerbated by a huge turnout. Noisy warning from frustrated Common Council Members, well in advance, were brushed aside, dismissed as "people who want to destroy the festival" and worse. By afternoon, even Duane Reade was out of bottled water, and food supplies were running short or completely out south of the subway. It was predictably symptomatic of a situation in which overwhelmed leaders at the Common Council were left, by RIOC, to their own devices without enough oversight to guarantee safety. The fact that we dodged a bullet on Saturday doesn't excuse mountainous failures by RIOC. In an environment ripe for terrorism, RIOC did little to engage or forewarn the City or Homeland Security about risks looming for the weekend. Registrations on RIOC's own Facebook Page should have lit a fire under the absentee landlord managing the place. 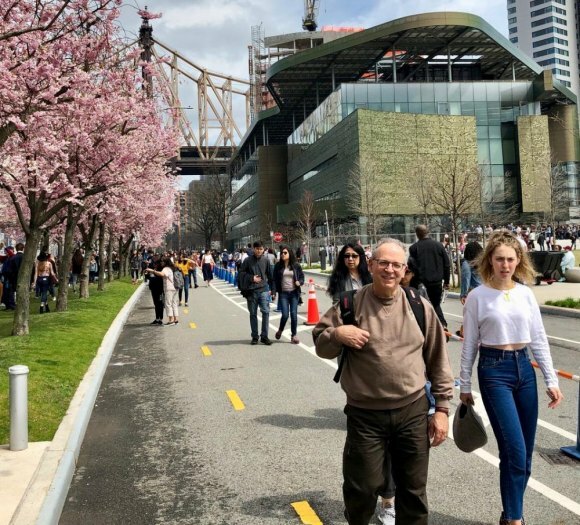 Estimates were, as of yesterday, that more than 25,000 people congested Roosevelt Island and all its resources on Saturday. But RIOC screwed up big time, although its personnel on hand behaved admirably under intense conditions. The worst screw up went unnoticed by most. While PSD and hired outside security performed cursory bag checks and wand examinations along both loop roads south of the Tram Plaza, planning was so lax, all one had to do to avoid scrutiny was to exit into Cornell Tech's campus where it was easy to circle back onto the loop road a few hundred feet beyond security, completely unchecked. It can't be emphasized enough how lucky we were that no one with bad intent exploited that gaping hole in security. Disregard for residents and others who are physically challenged has become a hallmark of Susan Rosenthal's administration. That continued during the festival. Transportation south of the Tram Plaza was by foot only. 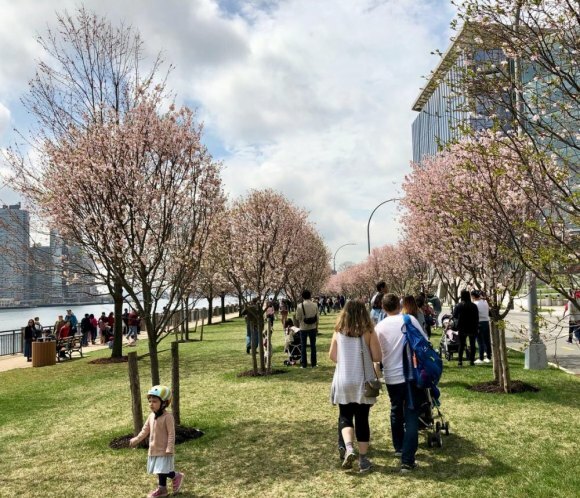 Frail, elderly and disabled were expected to make their way through long, slow moving lines for security checks and, then, walk all the way down to Four Freedoms Park. RIOC's enormous fleet of vehicles idled in the sun beneath Motorgate. Yes, in case you're wondering, RIOC was approached about this failure multiple times in advance of the festival and did nothing. And although RIOC also knew in advance that its sister State agency, the MTA would break its promise to not disrupt F Train Service for a second time, they refused to deal with it. Instead of clearly explaining how E Trains would be substituted and how to access them, in press releases and on their website, RIOC stiffly directed readers to the MTA for information via a link, as if everyone's online and able to navigate the complexities of a website covering all the MTA's railroad and bus services in the metropolitan region. It looked like RIOC was fluffing off responsibility with a weak reassignment. Could RIOC have done worse with vehicle planning? 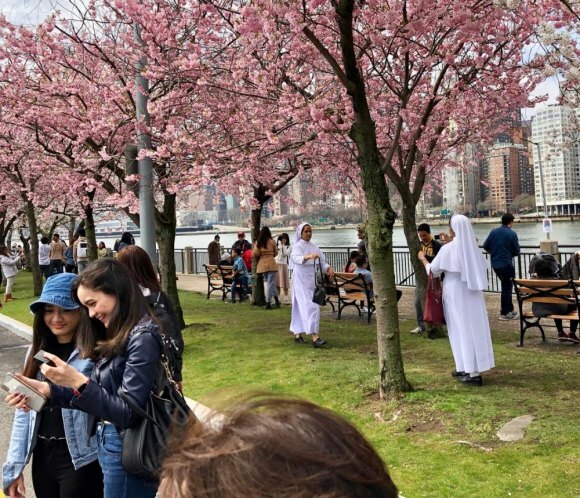 With nothing more than a single release announcing parking restrictions and suggesting there might be some Roosevelt Island Bridge congestion, RIOC left drivers to fend for themselves. A friend who lives in Manhattan Park, stranded in a jam that he said extend ten blocks in every direction, could not get home to his family. He sent an appeal over Twitter. In the end, knowing who to blame - RIOC - was of little relief. RIOC failed to engage with NYPD to control traffic heading for our small, two-lane bridge, a link that soon became crowded with pedestrians giving up on mass transit. The MTA and NYPD Come Through. Without much help from RIOC, the MTA, alerted by subway riders and concerned residents, sent in additional help to keep hours of congestion and delay inside the subway station from becoming an emergency. The MTA rerouted R Trains to pick up passengers on Roosevelt Island platforms along with scheduled E Trains. Local activist Frank Farance, aided by a contingent of frustrated Common Council Members, did what RIOC failed to do, contacting the local NYPD precinct, which responded by sending officers in to help with traffic and security. No injuries were reported, thanks to MTA, NYPD and residents' ad hoc intervention. Our elected officials, none of whom were on-hand defaulted to posturing about needing better transportation planning and blah, blah, blah we've all heard before and will doubtlessly hear again. Although not the "day of infamy" one reader suggested, failures in planning and management stained the community. Most NYC media did the best they could to focus on subway congestion because, really, they were taking the lazy route of relying on relentlessly negative Twitter whiners for news. Nobody from RIOC countered. Nobody spoke up for the beautiful event the Cherry Blossom Festival was. And while we're at it, who in New York City comes to a major event and expects to slide smoothly into and out of subway stations with no waiting? Some Twitter users, clearly. But come on, every big event, from professional ballgames to Times Square on New Year's Eve, comes with its own level of delays. Why pick on Roosevelt Island? Answer: Because it was convenient. In his Facebook statement, Jim Luce called for better future planning. If successful, that will mean turning management over to a single entity responsible for pulling all elements together, not this year's scattershot approach. We have the talent, but so far, we haven't had the leadership. That takes nothing away from Strong-Shinozaki and Tang, who did a magnificent job of arranging entertainment, but the Common Council is neither equipped nor by mission geared to running social events. And we'd suggest that demonizing community members who shouted warnings in advance should be stopped immediately. The dissidents were right and were ignored at everyone's expense. Under its current leadership, RIOC is not capable of handling the festival. They can't even control pedal assist bicycles running stop signs and racing down sidewalks. And besides, it's clear to everyone here that RIOC continues to be an outsider, mostly operating 9-to-5, weekdays only. Maybe FDR Four Freedoms, a well-oiled, professional operation, could form a coalition, or a group of concerned residents might be pulled together by Jim Luce or his foundation. We don't know what the best answer is yet, but it's time to consider solutions.